Many visited ski resort Val di Fiemme offers ski slopes in the correct proportions for beginners and young children but also for good skiers, located at altitude. of 860 to 2415 m. 8-campus: Latemar Ski Center, Ski Area Alpe Lusia, Alpe Cermis, Passo Rolle, Lavaze, Oclini, Nova Ponente, and Monte S. Pietro. Hotel Lagorai is among the best in the whole area of Val di Fiemme, is located in a sunny and panoramic position above the valley, in the center of Cavalese. Since the center is about 800m, shops, restaurants and bars 500m. Altitude of the resort is 1000 meters. Hotel Sporting is composed of two buildings and has a great location on the slopes Cermis. Accessible only by cable car (08:15 - 16:30). For hotel guests there is free parking available at the bottom lift station Cermis. Cavalese town center with restaurants, bars and shops is about 3 km. Residence Casa Cavalese consists of two buildings and is located on the outskirts of the town of Cavalese. It has a quiet and sunny location with panoramic views. Restaurants, bars and shops 1km, center 1.5 kilometers. The Aparthotel Residence Des Alpes is located 1.5 miles from the center of Cavalese. He has a quiet, sunny location with panoramic views. Residence Des Alpes is located 1.5 miles from the center of Cavalese. He has a quiet, sunny location with panoramic views. Pleasant Hotel Eurotel is situated amidst mountainous scenery Alpe Cermis at an altitude of 2000 meters directly on the slopes. Available only Cermis lift (runs 08:15 to 16:00). Cavalese center about 3 km. Hotel Grünwald is located on a quiet sunny spot about 300m from the center of Cavalese, with shops, bars and restaurants. Hotel Bella Costa is located in a panoramic spot about 1km from the town of Cavalese ski resort in Val di Fiemme. Negritella Residence is located in the historic center of the town of Cavalese, a ski resort in Val di Fiemme - Obereggen. Shops and restaurants are nearby residences. Popular Aparthotel Majestic is conveniently located about 400m from the center of Predazzo in the ski resort of Val di Fiemme. Shops, restaurants and bars nearby - about 200m. 1018 m is the altitude of resort. The apartments are located in the town of Cavalese, 100 meters away from the center of -1.5 km. Altitude of the resort is 1080 meters. Hotel Montanara is located in north-eastern edge of the valley at the confluence of Avis and Travignolo in the popular resort Predazzo, only 500m from the center and shops. Pleasant Hotel Touring is located in the center of Predazzo ski resort Val di Fiemme. Popular resort is part of a wider Dolomiti Superski area. Elegant family-led hotel Bellaria is located on the outskirts of town Predazzo, at an altitude of 1,018 mA is peaceful location. Excellent starting point for ski tours in the valleys Val di Fiemme and Val di Fassa close. Hotel Liz has a sunny location in Predazzo (1,080 m), only a few minutes walk from the city center and bus station. Well-equipped hotel with excellent references in the middle of the ski resort Val di Fiemme. Parkhotel Rio Stava Family Resort, completely renovated in 2011, is located in a quiet location about 800m from the village center and 5 km from Tesero Cavalese. Holiday Resort Hotel Veronza Resort is located in a sunny and panoramic location in the town of Carano. From Cavalese's center is about 2 km. It consists of residential and hotel part. Residential Complex Veronza Centro Vacanze is located in a sunny and panoramic location in the town of Carano. From the center of Cavalese is located about 2km. The recently built Hotel Villa di Bosco with a pleasant family atmosphere and excellent cuisine is located in Stava (Tesero), at the foot of the legendary group Latemar. 1250 m altitude resort. Sport renovated hotel Pampeago is located at an altitude of 1975 meters above sea level, directly on the piste. Family kept Latemar hotel is situated in a quiet area about 3 km from Cavalese at 950 m above sea level, the center Castello di Fiemme. Pleasant popular hotel Zanon is strategically located in the Val di Fiemme in the village between Ziano di Fiemme Cavalese and Predazzo. Center with shops and restaurants about 250m. Family guided hotel Villa Jolanda is located in the center Ziano at an altitude of 1000 m asl - Val di Fiemme area. 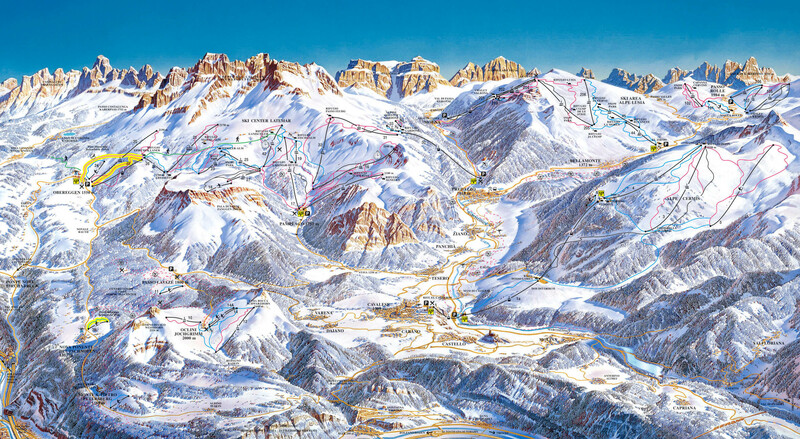 consists of several separate ski areas larger (Ski Center Latemar Alpe Cermis), smaller (Oclini, Obereggen) also miniature (Passo Lavaze, Nova Ponente). Lift possibilities for accommodation in Val di Fiemme created from the surrounding slopes known and popular ski resort. Many hotels, apartments and private housing in located in towns and villages Predazzo, Ziano, Panchia, Tesero, Cavalese, cooking, Daiano, Carano, Cavalese, Castello, Molina lying on the broad valley of Val di Fiemme at an altitude of about 1000 m.